DAZ Studio has been updated to version 4.5.1.6. DAZ 3D Plugins that were available for version 4.5.0.114 were updated but will NOT need to be updated (re-downloaded) since they are compatible with this new version. This release contains numerous bug fixes and other enhancements - including support for the DSON Importer for Poser. See the change log for more details. The Genesis Essentials Starter Bundle (default Genesis content) has also been updated to support this release but is not required to download for users of version 4.5.0.114. The new version of DAZ Studio is available here. I still notice the Recompiling shader message when using the built in UberSurface among many others. The recently-update Reality 2.0 for DAZ Studio also does not like this newest version of DS4.5 Pro. I am about to take the plunge and install 4.5 -- had to revert to 4.0 earlier but now there's a new update so I'll give it another chance. All my files are backed up, what I need to know now is do I need to install the Genesis Starter Essentials 1.6 file if I also have the one that came with the DSON for Poser plugin? I'm planning to use Genesis in both Studio and Poser. No, the 1.6 version is the same for both DS 4.5.1.6 and the DSON Importer. I believe installing the new one will uninstall the old, but I'm not certain, as I install to a dummy location and then move to my real cntent folders, so the uninstallers won't work for me. How large is the dl? I've reset my download for DS4 pro and keep getting time-out errors. latest attempt died at 84 meg. Edit: I can't download anything!!! Have reset several items and have used up all my dl's because they all die before dl is done!! WTF!? First, let me apologize right off the bat if this has been posted anywhere and dealt with. If so, please give me the link to the fix. Okay, as I was installing this new upgrade 4.5.1.6 = I began getting errors - I clicked ignore because after the second attempt and getting the sames errors, I wanted to write them down. I did go on with the install, but I haven't gone any further - I stopped to make this post. Please, if anyone knows - why did I get the above errors and will Daz Studio function normally after installing while getting the above errors? What malfunctions will the errors cause within the program? Should I just reinstall the previous and wait a while before moving ahead? These are related to the valentinadb used in the CMS. We need to know the actual error(s) that you are getting before we can tell you what is going on. OK. Are you running any type of malware protection such as Avast? If so, these will cause problems with the ValentinaDB as the sandbox will get in the way. 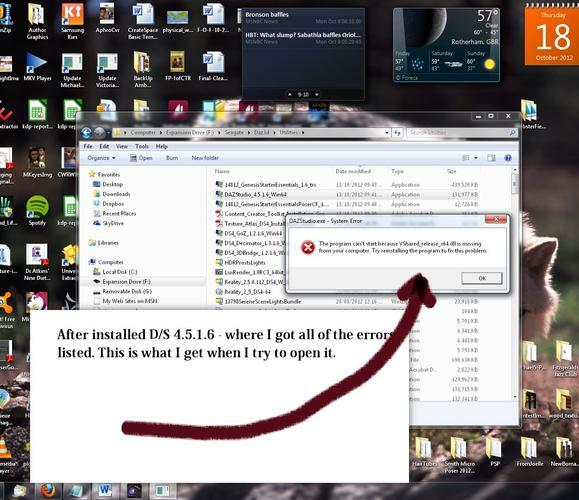 If so, disable the protection during the install. You were right, it was the Avast. I turned it off... and now 4.5.1.6 is installed. Now... how do I get CMS to run and STAY running? 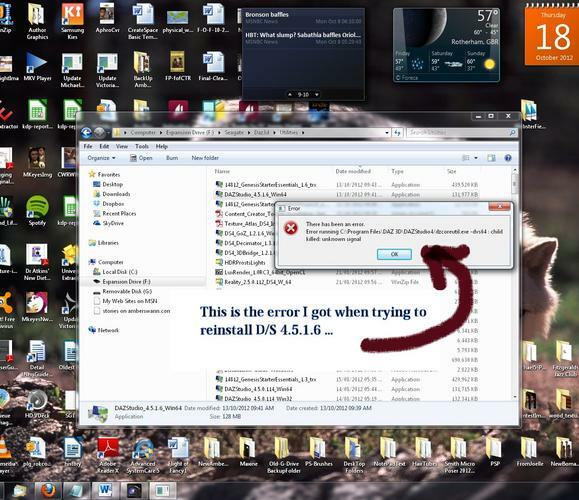 The last two versions, it will NOT stay on, and run without having me going into Task Manager to get it started. Or going into Start up under Daz3d and then, Content Management yadda yadda - I start it there as well, if the first place doesn't work. If you disable Avast temporarily, does the CMS keep running? As fixmypcmike suggested, Avast might be killing the CMS due to the need for a TCP port it doesn't recognize. Otherwise, make sure that the CMS service is set to 'Automatic' Startup in the Services Utility in the Control Panel. Edit: You are right. They changed directories and file names. Well, maybe I'm a lucky fella because it was installed with no problems like mentioned in previous pages. :red: Download issues again, sorry -- what are the file sizes of DAZStudio_4.5.1.6_Win64.exe and 14812_GenesisStarterEssentials_1.6_trx.exe supposed to be? And these are still the latest versions, right? Yes, those are the current official releases. With Windows...UAC, firewalls and AVs all 'fighting' to 'protect' your machine...it's a wonder anything can get installed and run properly...except malware, that is. Plugins (and shaders and scripts) have not needed an update since the original 4.5 release (the first non-beta, that is, 4.5.0.114). Resetting my download for DS 4.5 beta didn't work. The old version came up for download and not DS 4.5.1.6. How do i fix this? You need to reset a non-beta version of 4.5. If you don't have one, buy 4.5 in the store for 0$. 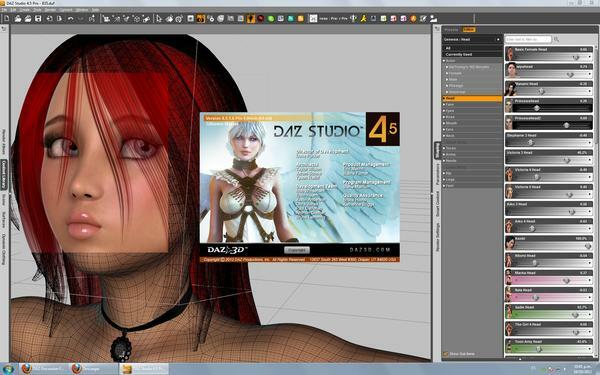 I've just installed DAZ Studio 4.5.1.6 and have a new Decimator registration which I entered in the dialog. Problem: Decimator is not showing up under Tabs even after restarting DS. Do I need to install it again?